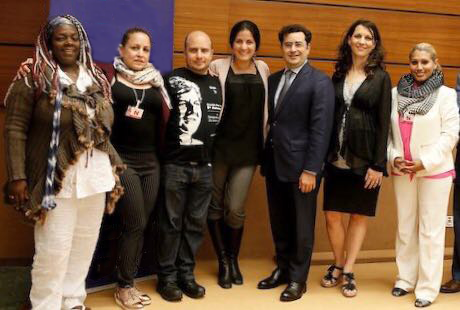 Three Cuban activists travel to Brussels at the same time as the Chancellor of the dictatorship. The three promoters of Cuba Decide belonging to different organizations of civil society in the Island, demanded democratic changes in the Island as conditions that Europe must evaluate before implementing the agreement. Since the Council of the EU signed the Political Dialogue and Cooperation Agreement, PDCA, with the Cuban government in December 2016, and the European Parliament endorsed the agreement in July the year after, member state after member state have been ratifying the agreement without criticizing the totalitarian Cuban political system or the deteriorating human rights situation. The Cuban constitution and electoral system are designed to prevent the free expression of the sovereign will of the Cuban citizens, and their effective participation in elections. Government authorities, including electoral ones, act in a coercive and arbitrary way, and systematically violate the civil and political rights of the Cuban people – especially members of the independent civil society and political prisoners – who continue to be victims of the repression of the political police since 60 years. It is therefor time for the elected members of the EU legislative assemblies to take their responsibility and condition the ratification of the PDCA with democratic reforms in Cuba. In order for the agreement to enter into force, the national governments need to pass the ratification of the agreement through their legislative assemblies for ratification. The fact that the provisional version of the agreement is already being implemented, does not mean that national legislative assemblies should surrender their possibility to influence the process. The status of the ratification processes in the member states can be found here. The core purpose of this process should be to force the Commission, and its foreign policy branch, the EEAS, to state what reforms should be implemented in Cuba in order for the Cuban government to uphold the principles of human rights and democracy stated in the PDCA. The core problem of the agreement is that it does not specify democracy and respect for human rights as objectives of the cooperation and political dialogue, it only describes them as principles the agreement relies on. This makes it difficult to evaluate the results of the agreement, and the parties avoid explaining what will change the coming years, hence it becomes impossible to say if the Cuban government is fulfilling it. However, by using the ratification process in the member states highlight this problem and demand clarification from the EU what changes the it wants to see, the process will create a political pressure on both the Cuban government and the EEAS to make clear their aspirations. In order for the legislative assemblies to ratify the PDCA, they should demand from EEAS to commit to the following. Recognizing that the Cuban citizens have the right to change the political system of the country through the exercise of a free vote and “determine their own political, economic, social and cultural regime” as established in the Declaration of Vienna adopted by the Cuban government and the European Union member states in 1993. Holding of a plebiscite inside the Island on changing the political system to allow the participation of the Cuban people in free, fair and multiparty elections. Legal reforms in order to guarantee freedom of the press and the freedom of association and manifestation. Ratification of the ICCPR and ICESCR. 2, Clarify that the EU contribution in the political dialogue and cooperation with the Cuban government should be expertise in the writing and implementation of these laws and reforms. If the Cuban government does not initiate these reforms within one year, the EU should leave the PDCA as the Cuban government does not fulfil the basic principles of democracy and human rights stated in the agreement. 3, Start cooperating with the Cuban independent civil society and press as in any other country, i.e. inviting civil society to formal discussions on the implementation of the agreement, contributing to the financing of civil society organisations, inviting independent journalists to press conferences and publicly denouncing politically motivated human rights violations. EEAS should also make clear that there will be no financial contributions to official Cuban organisations or state agencies, until the government publicly back the reforms necessary for democratization listed above. La entrada Cuba Decide denounced in Brussels that meeting with EU “legitimizes the regime” se publicó primero en Cuba Decide.